In this episode, Lisa answers the question: What do strengths look like under stress? She shares the three things that might unintentionally bring out the shadow side of your strengths under stress, and then gives you ways to reframe them from bad to better. 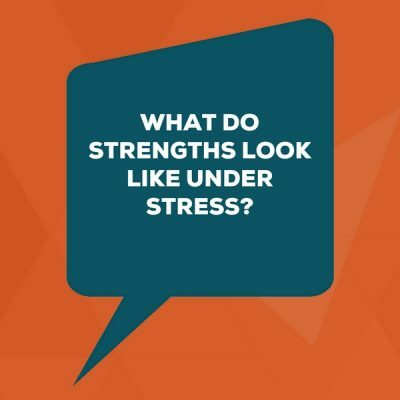 Today the question is about whether strengths look or act differently when they’re under stress. This is such a timely question because I woke up today … well, not at my best. After an awesome team StrengthsFinder event in NYC last week, I sat next to a prolific cougher and sneezer on the plane. I’m pretty sure he’s the one that passed me this horrible funk that has taken over my body. Well, those days can definitely bring out the shadow sides of your strengths. Those days can expose ugly sides of your talents — the side that doesn’t normally show up, even though you haven’t invested fully in that talent. The ugly side doesn’t show up day to day, yet the dark side is way more likely to rear its ugly head when you’re having a terrible week at work. When things are frustrating, what’s your typical response? For example, maybe you lead through Restorative and you resent the very problem that gave you the bad day (even though you normally get excited about solving problems). Maybe your Learner talent is annoyed because your team moves too fast to give you a chance to become the deep subject matter expert you want to become to put you at your best. So rather than coming at the angle with the frustration about how she treated salespeople, we could first find common value in the fact that she made those rules in order to create a good customer experience. We both valued that. When it came time to solve her problem of the sales people not filling out her forms (which is why she was rude to them), we could use the customer experience to keep our conversation aligned to something we both wanted. Another woman with the Competition talent decided to use her constant comparison to become a cheerleader for the team. She would dig into the metrics, both inside and outside the company, to highlight where other people were their best in their roles or in their industry. To take the “Under Stress” exercise further, explore your talents through the lens of this Yucks inventory. Ask yourself which 1-2 of the words or phrases are hot buttons for you. Then consider what situations call on that “Yuck” often.